April was full of stress and pain and I’m honestly glad to see it gone. Another perk is that flowers and trees are blooming and the air smells wonderfully like spring (until you pass a ‘grower’s’ house and then it’s awful. but anyway.) I printed out my goals and affixed them to my laptop so I saw them several times a day – it helped so much in reminding me to do them . . . or to at least think about doing them. EDIT Amelia book til ready for a professional editor. – For the first 2 weeks of the month I did good on this. In the midst of writing a longer, more detailed, makes-more-sense-to-the-story scene. Make writing a habit most every day – The first 2 weeks were spot on! Read more books on Jewish living – I’m halfway through Messianic Jewish Manifesto by David H. Stern. Write a letter to one person a month – yes!!! Be stricter on NO SUGAR and more veggies/juice – the last few weeks I have. Even got my OH to stop bringing home sugar-filled items this past week. Plus I’ve definitely increased my veggies and juice intake! start a container garden – started planning it!! plan a stay-cation for our 4th anniversary – This didn’t happen. I was in severe neurological pain and OH was sick. I ordered take-out (through Grubhub) , he rented some movies from Redbox, we ate and he fell asleep while I watched a movie. All well. We were both home and together, that’s what matters! ~A lot of the stress of April was been car-related. OH’s car was full of mold. The Subaru started smoking and rattling worse than ever and had to go to the shop. The Bug blew a belt. The puppies enjoyed the morning OH was working on the Bug as they got to hang out front with us. ~I’ve been wanting this book and this book for a while now, I might end up buying them this month! 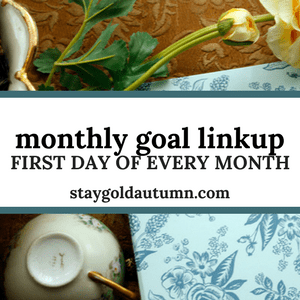 Once again, I’m linking up with StayGoldAutumn.com for monthly goals! Check it out! Any fun plans for May? I love the pictures of your dog! Hope May was a better month than April seemed to be.